I had my usual conversation with a tray of mince last night. Which normally goes along the lines ‘so what are we doing with you tonight’. Anyway, I ended up adapting B-Well’s idea and made Spicy Meatballs stuffed with Mozzarella Cheese and Spaghetti in Marinara sauce. Add everything (except cheese) together in a large mixing bowl. Using clean hands mix to combine but do not over mix. Using ice cream scoop (sprayed with cooking spray) scoop out mixture into your hand. Make indent with fore finger and insert mozzarella cube. Close firmly and roll between two hands and place on tray. 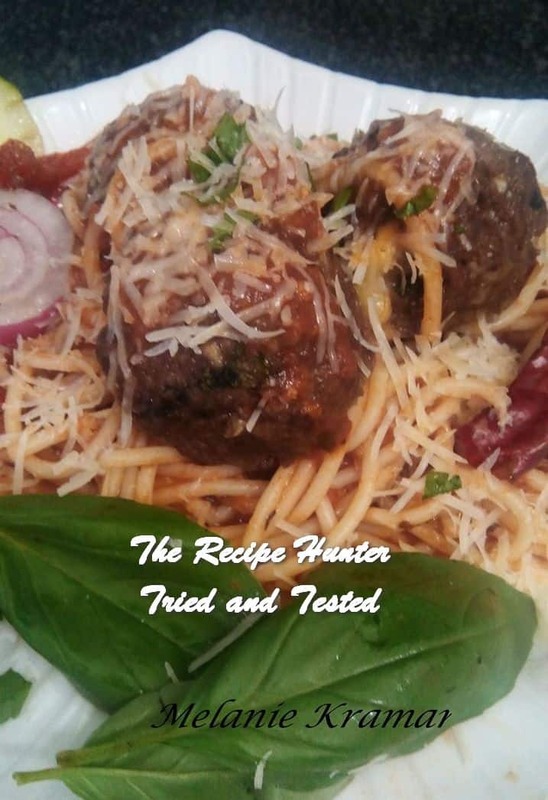 Refrigerate meatballs for at least 30 minutes. Preheat oven to 180-190 degrees. When oven hot reduce to 170 degrees and bake for approximately 30 minutes. [I have a fan oven so adjust accordingly if you don’t). Pour tomatoes into a large bowl and crush with your hands. Pour 1/2 cup water into the can and add it to tomatoes and mix around to get tomato juices. Set aside. In a pan over medium heat, heat the oil. When it is hot, add onion fry till golden. Add garlic. As soon as garlic is sizzling (do not let it brown), Stir. Add wine (if using) scraping bottom and allow to reduce. Add the tomatoes, and the juice. Add whole chili or red pepper flakes, (I added both), oregano (if using) (I did), bay leaves thyme and salt and pepper. Place basil sprig, including stem, on the surface. Let it wilt, then submerge in sauce. Discard bay leaves, basil and chili. [NOTE : Because this recipe calls for the chili and basil leaf to be discarded at the end I opted to include the and/or options of the red pepper flakes and oregano – you can choose the and/or classic option but it came out yummy the way I did it). I boiled spaghetti in salted water with a splash of olive oil in the meantime. And as soon as it was done and without draining it used a pasta spoon and just ladled it straight into the sauce. Oh Melanie!!! What fun we would have the three of us! Now I’confused…I thought you were Melanie?? ?